Review of DeWalt Tough System Products. If you caught the last review of the Dewalt Cordless Combo Kit then you probably noticed that it comes in a really beefy looking black carrying case which I promised to address during the next entry. Well here it is! Today we are going to zoom in on the DeWalt Tough System products and understand a bit more about why this product line is an ideal solution for your tool carrying needs. When you’re preparing to head to a job that’s away from your shop you automatically accept that you will need to devote some time to making sure you have all the right tools and small consumable hardware. If you’re like me this can some times take longer than I prefer to round everything up and get it loaded in the truck. DeWalt has introduced the Tough System product line as your go-to solution for your go-to tools and hardware. These cases have a modular design and all work together as one stackable, portable, lightweight but heavyduty storage solution. These boxes all stack together to create a tall mobile tower you can easily maneuver using the mobile base which features large rubber tires and a telescoping handle. Stacking and locking the cases together is very straightforward. All of the boxes have molded posts on the bottom that serve as feet when you set them on the floor and then serve as locating pins when you stack them on top of one another. Once the case are stacked, simply snap each case to its neighbor using the locking levers on the side. Carrying these cases individually is made a bit easier with the handle options as well. There are two side handles and one front handle. All of them are spring loaded and fold away nicely when they’re not being used. The lid closure was pretty well thought out also. There are two large toggle latches that keep the lid closed and sealed against the large rubber sealing gasket. These cases are waterproof and small wall around the perimeter of the box that seals against the gasket. The seal works so well, DeWalt provided a pressure release valve on the largest box just incase an accidental vacuum is created with in the box due to changing temperatures or other conditions that would create a vacuum. In the event the lid is tough to open, you can simply crack the bleeder open and bleed off some of the vaccuum pressure in the case. Taking a look inside you can see that the smaller units can really hold a lot of stuff. The smaller compartments that are on the underside of the lid are ideal for really small hardware such as small fasteners or electrical connectors. These mini compartments fold down out of their “snapped” position and have a snap fit lid to contain all of your small gear. 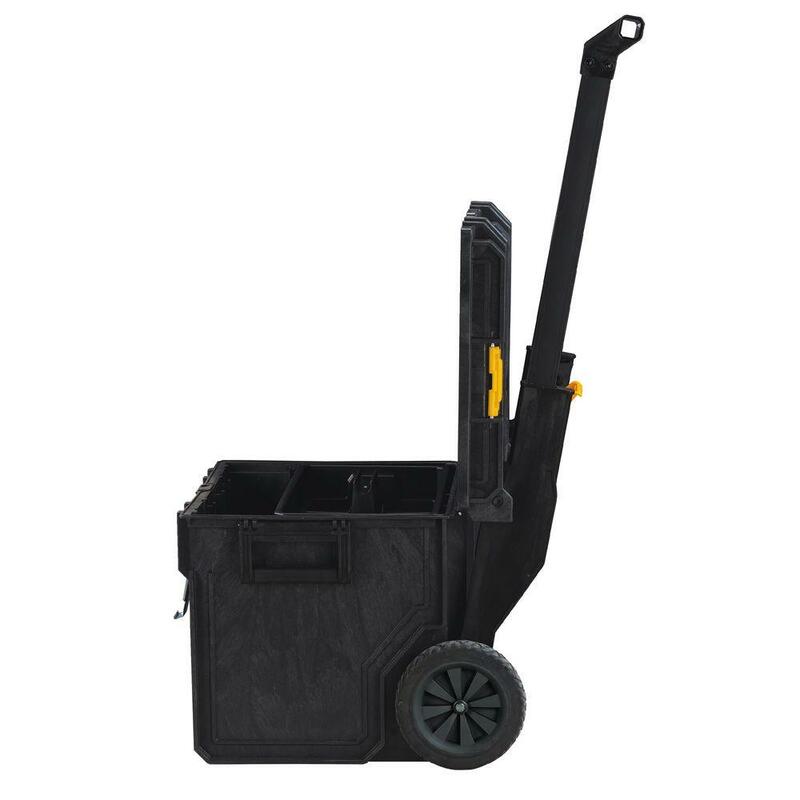 The smaller Tough Cases have removable bins for additional storage for some of your larger hardware such as nails, bolts, conduit straps and other medium size cargo. The largest Tough Case that was provided to me has a large removable tray like you would find in a conventional mobile toolbox. Obviously this works well to keep the smaller stuff such as screwdrivers and end wrenches from loosely hanging out with the larger items in the open well below the shelf. DeWalt built this line up with the tradesman/tradeswoman in mind. They are built to stand up to the abuse you would expect on job sites and the abuse that comes with constantly moving your tools and gear from one place to the next as the jobs change. Are they tough? Absolutely. These cases are made from 4mm thick “structural foam”…..but what is “structural foam” anyway? Rather than think of this material as “foam” it makes more since to visualize it as “porous plastic”. This material has a foam like (inside) structure that is created by blowing gas through the molten polymer (plastic) during the injection molding process. The outside surfaces are smooth while the inside contains tiny bubbles in it. There are numerous advantages of structural foam injection molding but the main one is STRENGTH. The honey-comb like structure not only reduces weight by about 30% on average but also increases the rigidity of the material making it perfect for the technician who needs a light-weight but tough cargo box. Although this storage system is a versatile solution for a variety of consumers, I think the ideal consumer for this product line are those that need their tools and equipment to be mobile and well organized between jobs. This would include jobs like framers, plumbers, electricians, audio/video/cable technicians, mobile mechanics, or even a tile technician. Thanks for dropping in to learn more about this product. Yall take care – April.